On 3 December 2014, Israeli soldiers raided the village of Tuqu’ at night and detained 9 minors. Photo c/o Tuqu’ municipality. On December 3, 2014 we got a phone call from Tuqu’ municipality in the Bethlehem area. The night before there had been a night raid in their village where 9 youth under 18 were detained. We called our driver and headed out there to meet with the municipality and the father of one of the detained children. 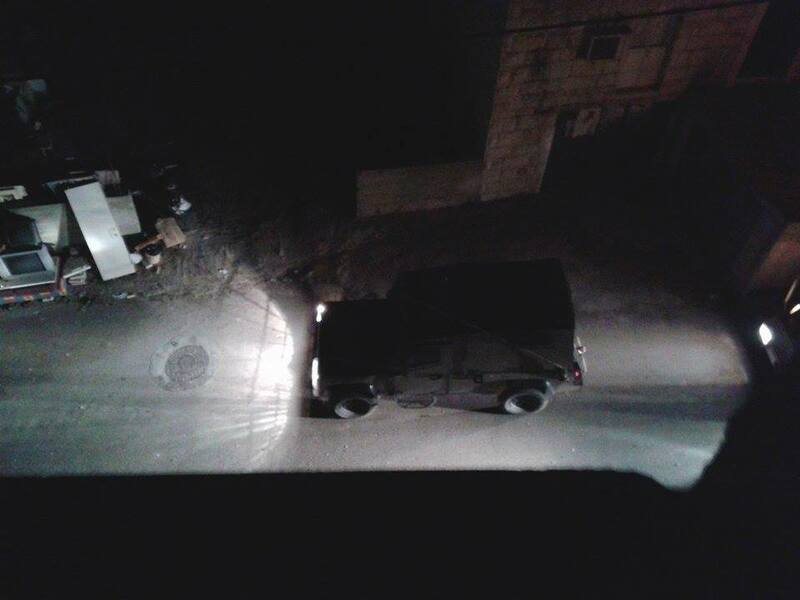 30 Israeli military jeeps and police cars with around 200 soldiers entered Tuqu’ village at midnight, they told us. They marched the street of the village and stayed until 6 am. The soldiers threw sound bombs in front of peoples houses and entered around 50 houses. All the soldiers either wore balaclavas or had their face painted. The father of one of the boys told us that soldiers entered their house, and shouted for his 16 year old son. They gathered the family in one room, and his son was blindfolded and handcuffed with his hands behind his back, without giving them any reason to do so. His mother wanted to give him some water to drink, but was refused. The soldiers stayed in their home for an hour while they threw furniture around and took pictures of the house and family members, and took everyone’s ID numbers. This was only one of 11 cases of detentions during this night raid. The boys who were detained were 13, 14, 15, 16, 16, 16, 16, 16, 17, 18 and 22 years old. In total nine boys under the age of 18. After 6 hours the military and police left Tuqu’ village, taking 11 Palestinians with them, without telling anyone in Tuqu’ where they were taken. So why does these detentions of minors take place? Breaking the silence, an organization of former Israeli soldiers telling their stories of their military service, told us that when new soldiers need to practice a night raid the best way to do so is to actually carry out a night raid, and to practice an arrest the best way is to actually arrest someone. They also told us that many of the Israeli military’s actions are taken to “make their presence felt”. According to Save the Children, families often define the rise of juvenile detention in their neighborhood as a tool, used by the Israeli army, to make them and their children lose a sense of security and feeling of well being in their own homes. 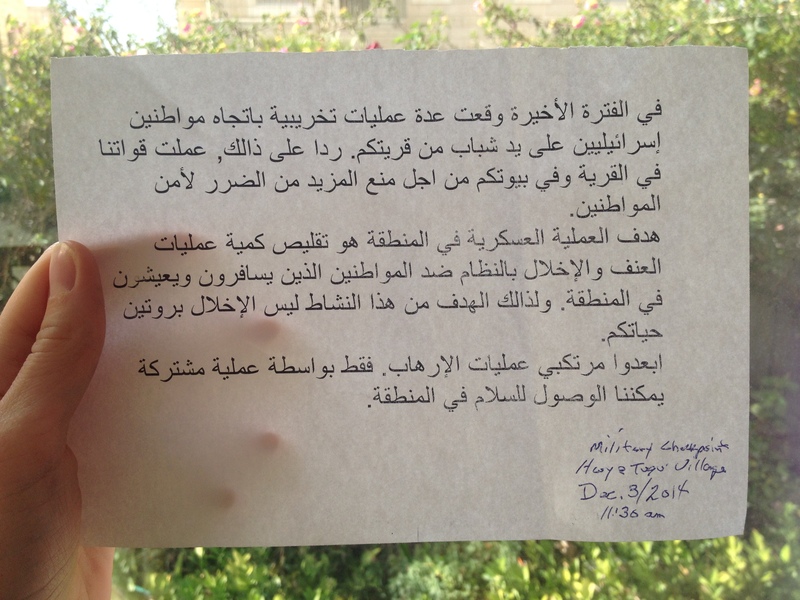 The note from the Israeli army explaining why they raided Tuqu’ village the night before. *The minors detained the night before were detained for throwing stones. The throwing of stones are the “terror attacks” and those who throw them are the “terrorists” that this note refers to. Thoughts from an EA after Omar, a 12 year old boy, was detained by the Israeli military. On Monday the 10th of March, in Azzun, a town located in the north of the West Bank, over 10 military jeeps and over 20 soldiers came to detain and arrest a 12 year old boy. After dark, in his own home, the soldiers came and took Omar’s 29 year old brother. However, the soldiers soon realised that they had the wrong family member and instead they re-entered the home. This time looking for Omar. The soldiers started asking and shouting for Omar, shouting at the women and children present, telling them that they would not leave the home until they had Omar. It took awhile to convince them that the 12 year old who had at first opened the door was the person they were looking for. After accepting that the young boy was who they sought they told his mother to grab a jumper for him and he was led outside of his home in his slippers to were the soldiers still held his brother. Here, Omar was asked to try on some shoes they had taken from the home. The shoes fit Omar. After this Omar’s brother was released and Omar was led away. Only his father was allowed to accompany him as he was escorted on foot to a road 10 minutes away just beyond the town of Azzun. Here, in the dark, Omar was asked to climb over the roadside barrier and down a roadside embankment and into an olive grove in order to match his footprint against a footprint in the soil of the olive grove. Escorted at this point by only three soldiers, into the dark field, myself and my colleague followed. During our interview with Omar, he demonstrates how he was blindfolded by the Israeli soldiers en route to his interrogation. Photo EAPPI/R. Ribeiro. Omar’s footprint, belonging to a pair of Vans and displaying the common diamond pattern of the brand, matched one of numerous footprints criss-crossing the olive grove. This olive grove was to the side of a road leading to the settlement of Ma’ale Shomeron. His charge, throwing stones at the cars of settlers. Stone throwing is a dangerous action and also one hard to prove and a footprint in a local olive grove is hardly damning evidence. It is a serious charge but most definitely not a charge necessitating the intimidating presence and inquiry of over 20 military personnel and vehicles. Omar was arrested by the Israeli Army in a night operation that unfortunately is far from uncommon, the large number of military present and the timing after dark adds to the already traumatic experience of child arrests. Unusually the Israeli Army allowed Omar’s father to accompany him and gladly we learned that Omar was allowed to return home in the early hours of Tuesday morning. It is not unreasonable to ask how the presence of 10 Jeeps and a couple of dozen soldiers, arriving and shouting at a family home at night while armed with automatic weapons and tear gas might contribute to the security of Israel. I asked a soldier at the start what was going on, he replied in one word “Terrorist”. Israel has a duty to defend its citizens against terrorism. However, there is no one standard and accepted international definition of terrorism and the question should be raised if it is appropriate to label possible stone throwing by a 12 year old boy as a terrorist act? A report by the former Special Rapporteur on the promotion and protection of human rights and fundamental freedoms while countering terrorism, Martin Scheinin recommended that ” the detention or imprisonment of a child be used as a measure of last resort” and raised concerns about Israel’s vague definitions in counter-terrorism legislation. When I later challenged the legality of their actions and the importance of child protection another soldier replied “We are the law in this area”. In this they identify their role as the occupying force that has the responsibility to ensure law and order in occupied territory. Israel has signed the International Convention on the Rights of the Child and a 2013 UNICEF report made 38 recommendations about the Israeli contravention of the rights of minors when arrested and detained. In October 2013 Israeli newspaper Haaretz reported that progress towards the ending of these contraventions had been limited. This eyewitness account from Azzun backs up this assertion. According to local contacts, in Azzun alone in 2013, 175 people were arrested. In 2014 so far the number has reached 35, 13 of these have been under 18 years of age. This is one village and this example is a mild version of something that happens frequently in villages in the West Bank. As a tactic to ensure law and order aimed at enhancing the security of Israeli civilians, arresting and imprisoning boys and the creation of a climate of hostility does seem to work against prospects for future peace. According to Defence for Children International every year between 500-700 hundred Palestinian children between the ages of 12-17 years are detained or arrested and prosecuted in military courts, most accused of the same crime as Omar – stone throwing. We visited Omar at his home two days after his arrest. He spoke quietly and in few words as he told us his story. 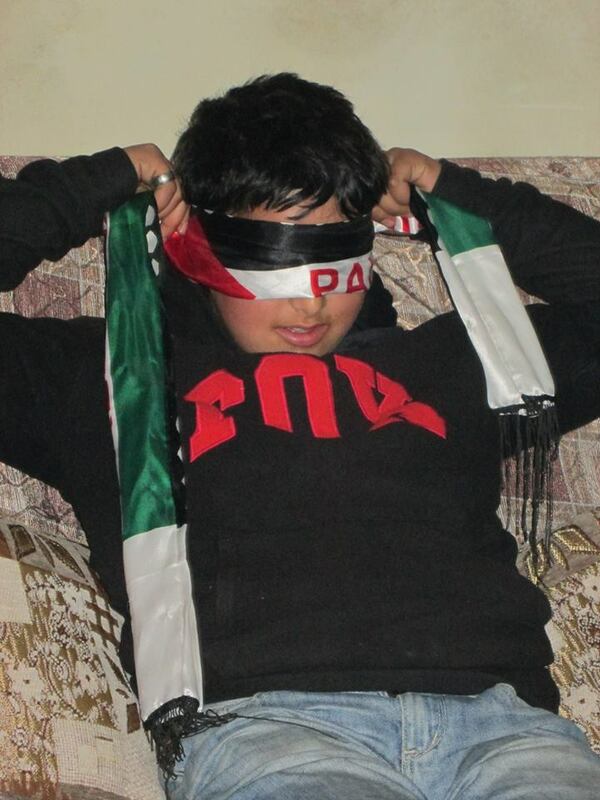 Omar told us that following his arrest he was blindfolded and his hands were bound by the Israeli authorities. He is withdrawn in his speech and and it is only with encouragement from his older brother that he continues his story. He tells us that he was interrogated in a small room, that the door was open and that he could see his father. He also tells us about how while he was interrogated he was screamed at and that he felt intimidated and scared. He is still scared. Omar was lucky, he was released without charge in the early hours of Tuesday morning and will spend no time in prison. However, hundreds of other Palestinian children may face the same trauma and the possibility of incarceration unless the Israeli authorities take the necessary steps to implement all of UNICEF’s 38 recommendations to ensure the welfare and protection of children in accordance with the Convention on the Rights of the Child and other international laws, norms and standards. *This blog was first published on one of our EAs blogs: Operation Observation: A Pacifist in Palestine. 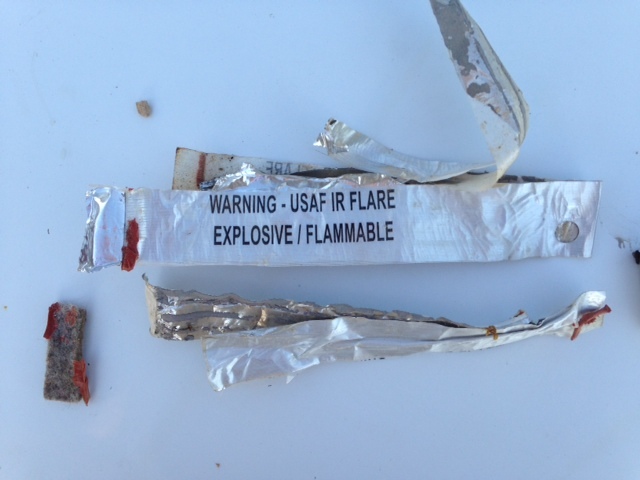 UXO stands for unexploded ordnance and is one of many abbreviations for different kinds of military explosive material that is found randomly scattered on the ground. These devices can easily explode when touched. Children are the main victims of UXOs as they are the ones playing in the open fields. Being children, they are curious and do not know how dangerous this material is. In Palestine, there are UXOs everywhere due to military training excercises. These training exercises not only occur in declared military firing zones, but in other locations as well. Moreover, even in the so-called “firing zones,” Palestinian civilians live there and own land there, making them the direct victims of landmines and UXOs. Children play in their fields and are exposed to UXOs on their way to school. They are exposed while herding, collecting wood, and helping with plowing. Defence for Children International Palestine section documented in a study carried out between 1997 and 2000 that 37 Palestinians injured or killed by landmines or UXO. Of those, 30 were children, with 7 killed and 23 injured. They report that areas determined as fields filled with landmines or UXO are not properly fenced off, which compounds the problem of ordinary civilians, especially children, in an agrarian society coming into contact with UXO during their everyday activity. Maher displays his burnt hands. Photo EAPPI/D. Waring. We met Maher on the December 19th. On December 8th he was shepherding near his village Kashem al Karem. This village is located in an Israeli military zone in the south eastern part of the West Bank. Maher found an unknown object printed with English words he couldn’t understand. Even at 15 years of age, Maher is still curious. He picked it up off the ground to have a closer look. The object exploded immediately. Maher fell to the ground, hurting his knee. Both hands and forearms were badly burned. Fortunately, his family was close by. They cooled his burns with cold water, and took him to the hospital in Yatta where the doctors diagnosed second degree burns. Treatment for burns is painful. 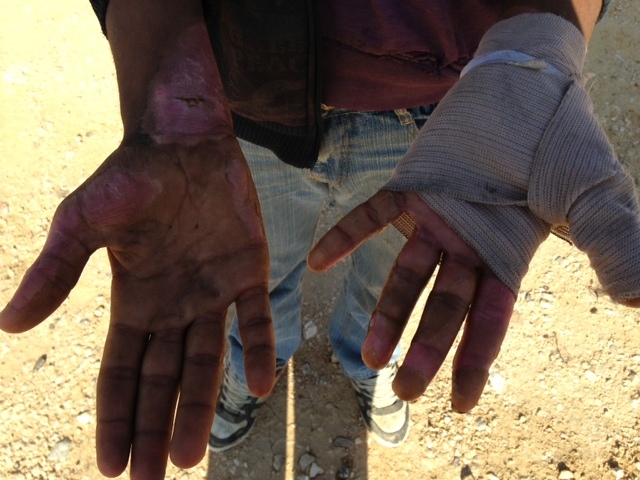 Maher went to the hospital every second day to have his wounds cleaned and the dressing changed. The day of our visit still wore bandages around his left hand. New skin was just forming on both hands that were burnt. He tried to move his fingers to prevent constriction by scars. He bravely smiled at us despite the fact that he was clearly in a lot of pain. The problem of landmines and UXO and the pain they can inflict, is one more way through which the occupation dictates the everyday lives of the people in Palestine. It is often overlooked and undocumented, but for the families and children it impacts, life can unexpectedly change forever. EAPPI is a programme of the World Council of Churches, however, the impressions, hopes and ideas expressed in this blog are the contributions of the authors and do not necessarily reflect the opinion or policies of the World Council of Churches.